Ready NOW are our adorable Blue Tabby boy kitten. Our Mom is a Bluepoint Tortie. 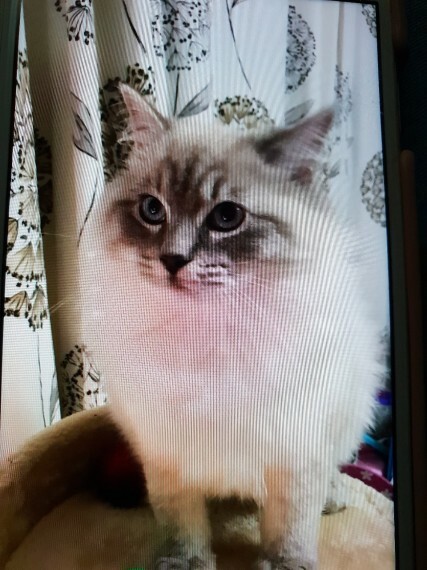 and Dad a Bluepoint Tabby both from Champion lines and are extremely loving and loyal and floppy GCCF registered active. HCM . PKD clear by Langford Ragdolls. they live with us and can be seen at viewings with their complete paperwork. This gorgeous fur baby has been raised with endless love and affection. loads of cuddles. and lots of playtime on daily basis. His cute little individual personality is coming through already and they are just so adorable. Kitten is used to regular household noise. young children and dogs around him. Kitten is being fed highest quality kitten food. Kitten will leave to their new forever home with. .GCCF registration card non.active . 5 Generation Pedigree Certificate . 8 . 12 week injections . Flea . Worm treated by advocate . Twice health checked by Vet before leaving for their new home . Completely weaned on highest quality kitten food and starter bag will be provided to take to new home . Litter box trained . Scratch post trained. Blanket Kitten is ready to leave to their 5 star forever home now. Kitten is 650. A receipt for payment will be provided for your own piece of mind. Please note Ragdolls are indoor cats only. please research the breed. Thank you.